When you walk into Mrs. Kelder’ s Cakes, a compact, tidy bakery located in the heart of the village of Manlius, the attention to detail is palpable. The cookies and cupcakes in the front case are exquisitely decorated and inviting. The bistro tables are hand-painted with designs by the owner’s neighbor. The building itself embodies the vintage charm that Manlius locals love. 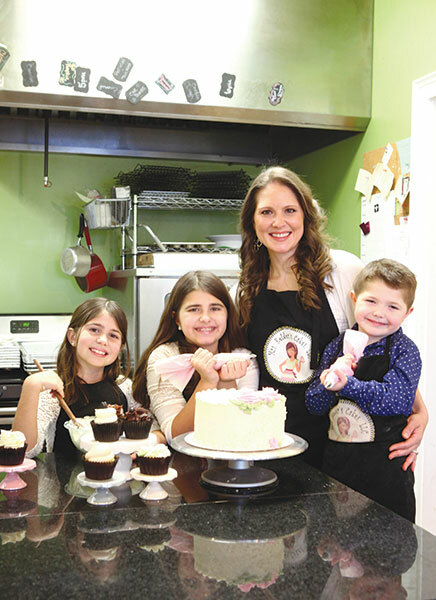 Certainly, customers might think, the owner—Cyndi Kelder—was born to bake. And definitely, they could assume, her bakery is the fulfillment of a lifelong goal. Kelder, who worked for a decade as an athletic trainer for the Fayetteville-Manlius School District before opening Mrs. Kelder’s Cakes in 2013, says her interest in baking developed gradually. She made cakes for family events, and then gradually started bringing treats to school. The students enjoyed the sweets, and word of mouth spread. Kelder has since made a name for herself by applying her artistic eye to every order. Her frostings are exquisitely colored and carefully applied, and her ability to turn almost any idea into a specialty cake has made her bakery the go-to place for those seeking the ultimate birthday treat. “We try to make everything a treat for the eyes as well as the palate,” Kelder says. When she made the decision to make baking her business, Kelder spent a lot of time developing her recipes. She could use mixes and pre-cracked eggs or substitutes, like other specialty bakers do. But Kelder thought it was important to develop fresh, signature recipes that would draw repeat customers. Her chocolate cake and sugar cookie recipes were early hits, while her red velvet recipe took more time to formulate. Currently, she has about 17 choices in the bakery case every day. “Everything is made fresh, within hours of you picking it up,” Kelder adds. She often has flash “Happy Hour” sales on weekday evenings, when everything in the case is $1. Kelder, an Ohio native, opened her storefront at a point in her life when few women would choose to do so. She was stepping away from a successful career while adding to her growing family. She and her husband, Derek, live in Fayetteville with their three children: daughters Mackenzie, 10, and Morgan, 8 and son Max, 4, who was just a year old when the bakery opened. Kelder credits her family—and Derek in particular—for supporting her, as the business often pulls her away from the household routines. The location for Mrs. Kelder’s Cakes was also a factor: It’s a beloved older building on a strip of East Seneca Street that is home to another thriving newer business (Ironwood) and a local landmark (Manlius Art Cinema). The Kelders did just enough work to bring out the building’s character, preserving its historic charms. Locals were thrilled by the prospect of a new tenant that was not a chain restaurant or another drugstore franchise. Each Christmas, Allen orders a specialty gingerbread house from Kelder for an annual cookie exchange. “She blows me away with how gorgeous they are,” Allen says. With six children, Allen has also become a regular patron of Kelder’s birthday cupcakes—and every family member has a favorite. Allen enthusiastically recommends Kelder to others. Today, Kelder manages her schedule to maximize her time at home. Most of the baking is done in the morning, and then she goes home when her older children return from school. Derek, who graduated from FM High School, picks up the evening routine so Kelder can return to the bakery to finish sales or meet with clients. Last summer, Derek logged a lot of hours at the bakery, too. Mackenzie has recently begun to help with some of the baking (“She is very good at cracking the eggs, and I use a lot of them”), and Morgan has contributed some design ideas. Young Max has yet to find his role in the family business, which is fine with his mom for now. “I’m very big on hygiene, so I haven’t let him do anything in here yet,” Kelder says knowingly. Kelder plans to keep the business small enough so that she can still be involved in every aspect of it. But the one area where she would like to expand is delivery capability. Currently, the bakery has been limited to wherever the Kelders can drop off themselves. It’s not uncommon for Derek to make a cake or cupcake delivery on the way to his own business meetings. “Delivery service—that would be the next step,” Kelder says. Despite her neat-as-a-pin storefront, Kelder admits that being a small business owner has brought its share of behind-the-scenes turmoil. The struggles, as much as the successes, have made the bakery a learning experience that Kelder hopes her children will appreciate as they grow older. She suspects that they are already aware of the pride and hard work she has invested in Mrs. Kelder’s Cakes.